As we age, issues that affect our mouth can increase or worsen. So, it’s especially important to be aware of conditions associated with aging that can impact oral health. We hope this website, which is sponsored by Arcora Foundation, gives you valuable information and the resources you need to maintain a healthy mouth, teeth, and gums – to live a healthier life as the years go by. Most people know that regular medical and dental check-ups are important. But most of us don’t realize that the health of our mouth is important not only for our oral health, but for our overall health as well. The mouth is a window to the rest of the body. That’s why maintaining good oral health is one of the smartest things you can do for your body. There were over 830,000 visits to emergency departments across the country for preventable dental conditions in 2009 – up 16 percent since 2006. About 75 percent of people ages 60+ have only some of their natural teeth. Nearly 23 percent of adults ages 65-74 have severe gum disease. Dry mouth (reduction in saliva production), often caused by prescription and over-the-counter medications, is a problem for 30 percent of older adults. It contributes to significant tooth decay and gum disease. Learn about the important link between oral health and diabetes in just 90-seconds! Oral Care Cards for Caregivers — developed by Arcora Foundation and the Alzheimer’s Association – are now available in Spanish! 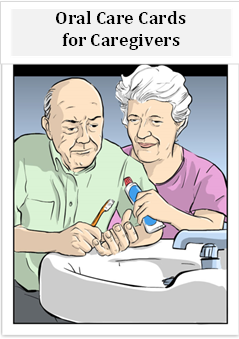 Providing oral care for someone with dementia can be a challenging task. This new resource shares evidence-based techniques that help people with dementia accept oral care and improve their health. Order your copy today! Learn why dental health, medical, and fitness experts are working together to help people take care of their whole body – mouth included. Unleash the power of The Mighty Mouth!